Ask users questions to help them work out if they can or should use your service. Doing this helps users save time as it tells them upfront whether they are eligible to use it and if they need it. It can also help reduce time and money spent processing queries from users confused about whether they’re eligible to use your service, or if it’s suitable for them. If you have complicated eligibility requirements you should follow this pattern. This will save users from having to read through large amounts of documentation outside of your service to work out if they can use it. Read guidance about designing your service so you give users information at the point they need it in the GOV.UK Service Manual. 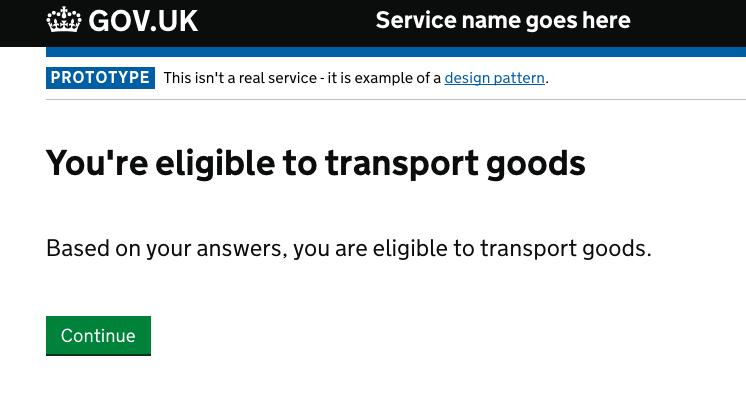 Do not use this pattern if you can reasonably include information users need to know about your service and its eligibility requirements on a start page. You should help people find out whether your service is right for them as soon as you can. If there are general rules about whether a service can or cannot be used such as an age limit or fixed deadline, include these on the start page. If a user is not eligible to use your service, explain why and, if possible, tell them what they should do instead. Read a blog post about testing and iterating this pattern. Please note this pattern used to be called ‘Check before you start’.